A good spa experience is hard to resist especially where ancient rituals and practiced treatments are derived from Mediterranean, Asia and the Middle East, Spa Phoenicia at the Inter-Continental Phoenicia Beirut will take you to a secret passage in the world of senses where soul, mind and body become a single entity. mylifestylenews writes. Four giant curved palm trees soaring high at the Spa Phoenicia gives you a warm welcome the moment when you enter as well as the recreational foyer. With a well equipped 24/7 fitness center in operation and a 20m indoor temperature control swimming pool set in a delightful background of cascading waterfalls, accompanied by aqua gym Aerobic apparatus, this separates the men's and women's sauna and steam room facilities, jacuzzi as well as a full treatment spa menu devoted to beauty, rejuvenation and relaxation. Spa Phoenicia uses precious elements from the Mediterranean Sea combined with holistic ingredients found only in nature. Specializing in Balneotherapy, Thalassotherapy, Thai relaxing therapy and Ayurvedic medicine, their unique philosophy brings together natural elements with the latest technology delivered by a highly trained professional therapist for unparalleled peace, serenity and visible results. Ayurveda is five thousand years of wisdom distilled into a system of practice aiming at detecting and removing or predicting and preventing mind and body imbalances before they manifest as diseases. It can be regarded as the most comprehensive and totalistic approach to healthy living since it incorporates physical, social, psychological, spiritual and philosophical facets of life. This holistic approach makes Ayuverdic legendary worldwide. We were offered half a session of Abhyanga full body massage and continued with a Shirodhara dripping of medicated oil on the forehead by opening our ‘third eye” for a better vision in a total of 90 minutes holistic yet relaxing treatment. Known for its therapeutic benefits and healing technique, the art of old Ayuvedic treatments are the science of life and healing based on centuries old natural Indian therapies that deliver you from chronic pain and illnesses using specially concocted oils, herbs and aromas gently applied to your skin in a salutary ambiance. 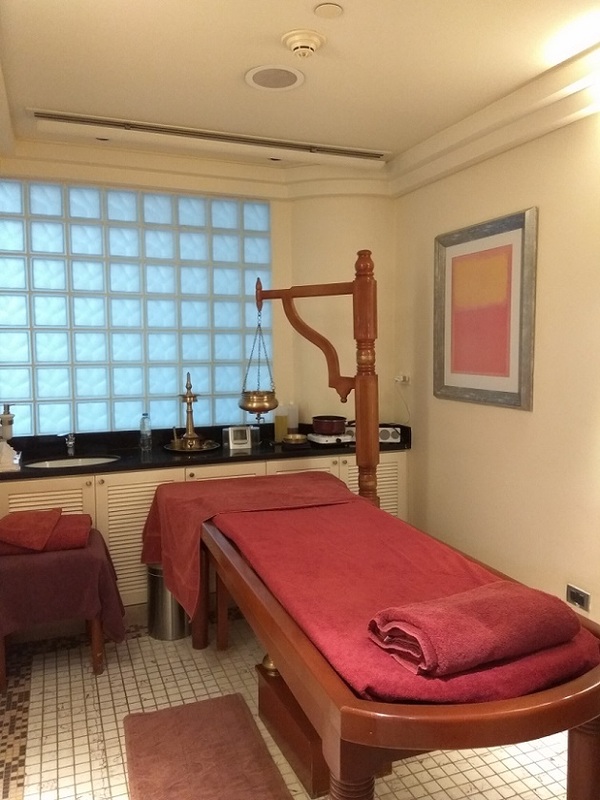 My Indian therapist’s strong hands use herbal oils applying to my head and body carefully chosen with accordance to my skin type (which is moderately dry) and gives a thorough whole body massage in my required medium to strong strength. The natural healing quality of these oils together with the traditional Indian techniques deeply cleanses and rejuvenates the skin while relieving the stress and tension from our body and mind. The second half of our Shirodhara treatment begins with a stream of warm medicated oil released to flow onto the forehead and the entire scalp region followed by a gentle head massage. It not only helps to enhance the mental relaxation, but also improves the functioning of the five senses, helps in insomnia, migraines, stress, anxiety, depression and definitely a jet lag reliever. A relaxed mind and revitalized body need to be complemented with a well-groomed personality. 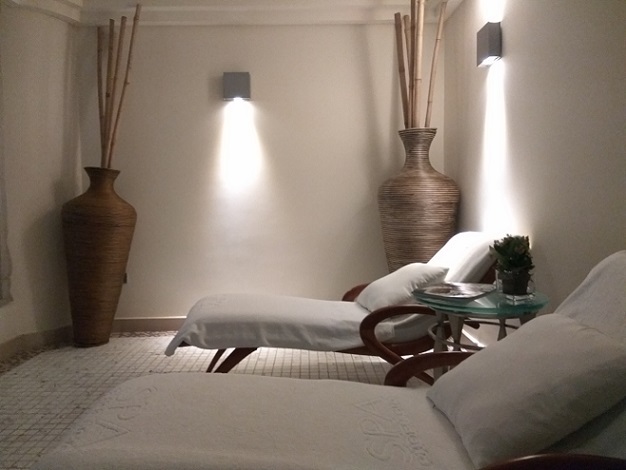 Spa Phoenicia in InterContinental Phoenicia Beirut is a true oasis in Beirut and has what it takes by offering you a full range of spa treatments designed to maintain health involving balance of the body, mind and spirit as well as emotions. At least for sure that evening we slept so well with the pampering and wellness that works.